The outstanding Islamic design is inspired by ancient architectural elements. 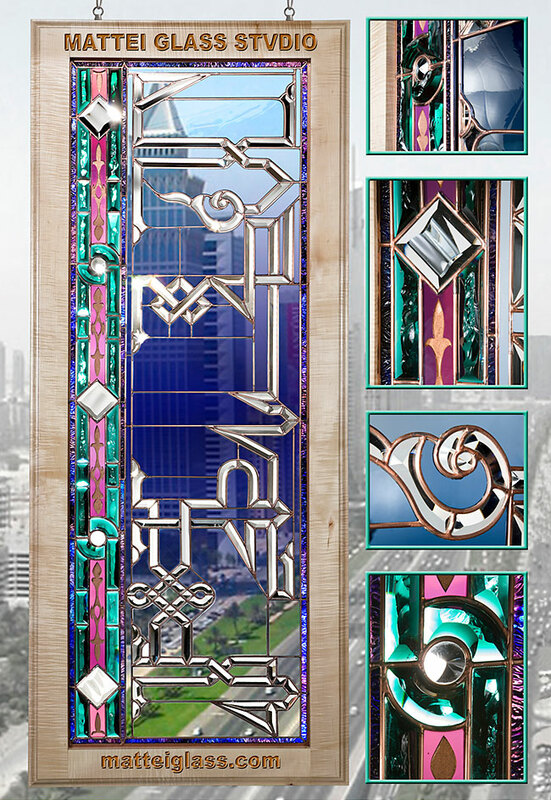 This work of fine art glass, framed measures 6 feet (1.8m) high. The Arabic motif, captured in clear hand bevel work, is laid out against a field of color phased, hand blown cobalt glass. The window is highlighted by a double border of hand beveled and chipped sea green dalle glass. This border surrounds more Arabic elements sandblasted into hand blown flash and filled with gold and copper leaf and covered with a solution of suspended liquid copper. The entire panel has been fabricated in solid copper channel and is framed with quarter sawn, curly maple.